Located in Covent Garden, the workshop of 18th century cabinet-maker and interior designer Thomas Chippendale (1718-1778) was a hub of sought-after design. The Yorkshire-born Chippendale leased the premises at 60-61 St Martin’s Lane in the mid 1750s and, joined by partner James Rannie, in 1754 he published his famous – and then ground-breaking – catalogue, The Gentleman Cabinet Maker’s Director, which illustrated his work. Chippendale’s clients includes something of a who’s who of the Georgian era – actor David Garrick, architect Robert Adam, Lord Mansfield (he installed Chippendale’s furnishings at Kenwood House in Hampstead) and Mrs (Teresa) Cornelys who apparently counted Casanova among her lovers. 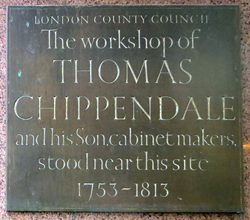 The Chippendale workshop remained at the premises in St Martin’s Lane until 1813 when his son, also Thomas Chippendale, was evicted from the site for bankruptcy. The current building dates from the 19th century. What happened to Thomas Chippendale’s business, after the son went bankrupt? If there was no other son or partner, who inherited the furniture patterns and models?